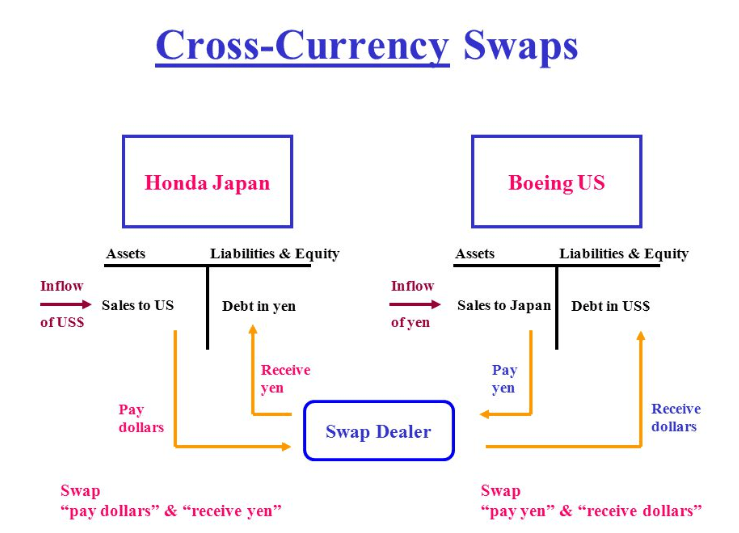 In a currency swap operation, also known as a cross-currency swap, the parties involved agree under contract to exchange the following: the principal amount of a loan in one currency and the interest applicable on it during a specified period of time for a corresponding amount and applicable interest in a second currency. Currency swaps are often used to exchange fixed-interest rate payments on debt for floating-rate payments; that is, debt in which payments can vary with the upward or downward movement of interest rates. However, they can also be used for fixed rate-for-fixed rate and floating rate-for-floating rate transactions. Each side in the exchange is known as a counterparty. In a typical cross-currency swap transaction, the first party borrows a specified amount of foreign currency from the counterparty at the foreign exchange rate in effect. At the same time, it lends a corresponding amount to the counterparty in the currency that it holds. For the duration of the contract, each participant pays interest to the other in the currency of the principal that it received. Upon the expiration of the contract at a later date, both parties make repayment of the principal to one another. In a cross-currency basis swap, the European company would borrow USD1 billion and lend ‎EUR500 million to the American company assuming a spot exchange rate of USD2 per EUR for an operation indexed to the London Interbank Rate (LIBOR), when the contract is initiated. Throughout the length of the contract, the European company would periodically receive an interest payment in EUR from its counterparty at LIBOR plus a basis swap price, and it would pay the American company in dollars at the LIBOR rate. When the contract comes to maturity, the European company would pay USD1 billion in principal back to the American company and would receive its initial ‎EUR500 million in exchange. Equity instruments held for trading?